The “MAC OS is infected with Spyware” pop up alert is a misleading advertising that created in order to force you into calling a fake Apple Support. If you find yourself facing the “MAC OS is infected with Spyware” scam on your screen, then most probably that your Mac has become a victim of malicious software from the adware (sometimes named ‘ad-supported’ software) group. The adware that causes browsers to open the misleading “MAC OS is infected with Spyware” pop-up warnings, is not a virus, but the virus behaves similarly. It modifies internet browser settings and blocks them from changing. Also the adware can install additional browser extensions and modules that will inject advertising links within the Google Chrome, Safari and Firefox’s screen. Moreover, the adware may install a browser add-on that can make changes to the browser’s startpage and search engine. As well as undesired web-browser redirects to the “MAC OS is infected with Spyware” scam, the adware can collect your Internet browsing activity by recording URLs visited, IP addresses, web-browser version and type, cookie information, Internet Service Provider (ISP) and web-sites visited. Such kind of behavior can lead to serious security problems or confidential info theft. This is another reason why the adware which causes misleading “MAC OS is infected with Spyware” fake alerts on your web browser, is classified as potentially unwanted application (PUA). The instructions below explaining steps to remove “MAC OS is infected with Spyware” fake alerts problem. Feel free to use it for removal of the adware that may attack Firefox, Chrome and Safari and other popular web browsers. The guidance will help you remove adware and thus clean your browser from all undesired ads. We can assist you delete “MAC OS is infected with Spyware” scam from your web browsers, without the need to take your MAC to a professional. Simply follow the removal guide below if you currently have the unwanted ad supported software on your MAC and want to delete it. If you’ve any difficulty while trying to get rid of the adware which created to show misleading “MAC OS is infected with Spyware” fake alerts within your web browser, feel free to ask for our assist in the comment section below. Some of the steps below will require you to close this web-site. So, please read the few simple steps carefully, after that bookmark or print it for later reference. The steps will help you remove “MAC OS is infected with Spyware” popup scam. These removal steps work for the Google Chrome, Safari and Mozilla Firefox, as well as every version of MAC operating system. The process of adware removal is generally the same across all versions of Mac OS. To start with, it’s necessary to check the list of installed apps on your MAC system and delete all unused, unknown and dubious applications. Carefully browse through the list of installed applications and get rid of all suspicious and unknown apps. After you’ve found anything suspicious that may be the ad supported software that shows misleading “MAC OS is infected with Spyware” popup scam on your Apple Mac or other PUP (potentially unwanted program), then right click this program and select “Move to Trash”. Once complete, Empty Trash. If you find that Safari web browser settings having been changed by adware that causes web-browsers to open misleading “MAC OS is infected with Spyware” fake alerts, then you may revert back your settings, via the reset web browser procedure. It will open the Safari Preferences window. Next, click the “Extensions” tab. Look for unknown and suspicious plugins on left panel, choose it, then press the “Uninstall” button. Most important to remove all unknown add-ons from Safari. Annoying “MAC OS is infected with Spyware” pop-up scam or other symptom of having ad-supported software in your browser is a good reason to reset Google Chrome. 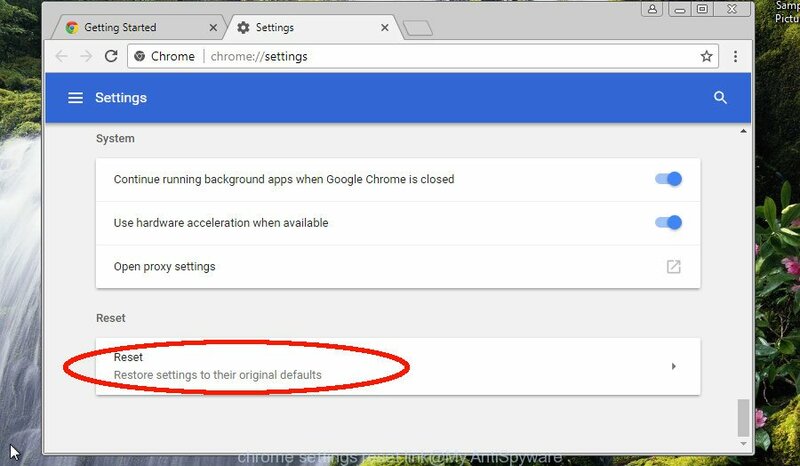 This is an easy way to restore the Google Chrome settings and not lose any important information. Carefully browse through the list of installed plugins. If the list has the extension labeled with “Installed by enterprise policy” or “Installed by your administrator”, then complete the following tutorial: Remove Google Chrome extensions installed by enterprise policy otherwise, just go to the step below. Resetting Mozilla Firefox web browser will reset all the settings to their default values and will remove “MAC OS is infected with Spyware” fake alerts, malicious add-ons and extensions. However, your saved bookmarks and passwords will not be lost. This will not affect your history, passwords, bookmarks, and other saved data. Launch the Mozilla Firefox and click the menu button (it looks like three stacked lines) at the top right of the internet browser screen. Next, click the question-mark icon at the bottom of the drop-down menu. It will open the slide-out menu. Click the “Refresh Firefox” button at the top right of the Troubleshooting Information page. Select “Refresh Firefox” in the confirmation prompt. The Mozilla Firefox will begin a procedure to fix your problems that caused by the ad supported software that cause misleading “MAC OS is infected with Spyware” popup warnings to appear. Once, it is finished, click the “Finish” button. If you are unsure how to remove “MAC OS is infected with Spyware” pop up easily, consider using automatic adware removal software which listed below. It will identify the ad supported software which causes misleading “MAC OS is infected with Spyware” popup scam on your browser and remove it from your computer for free. We suggest using the MalwareBytes Free. You can download and install MalwareBytes to scan for adware and thereby delete “MAC OS is infected with Spyware” pop-up scam from your web-browsers. When installed and updated, the free malware remover will automatically scan and detect all threats exist on the MAC OS. Visit the page linked below to download MalwareBytes Anti Malware. Once the downloading process is done, run it and follow the prompts. Press the “Scan” button to start checking your MAC for the adware which shows misleading “MAC OS is infected with Spyware” pop-up warnings on your MAC OS. This task can take some time, so please be patient. While the tool is checking, you can see how many objects and files has already scanned. Review the scan results and then click “Remove Selected Items” button. The MalwareBytes AntiMalware is a free program that you can use to delete all detected folders, files, malicious services and so on. If you browse the Internet, you cannot avoid malicious advertising. But you can protect your web browser against it. Download and run an ad-blocker program. AdGuard is an adblocker which can filter out a lot of of the malicious advertising, blocking dynamic scripts from loading harmful content. Once downloading is finished, run the downloaded file. The “Setup Wizard” window will show up on the computer screen. Follow the prompts. AdGuard will then be installed. A window will show up asking you to confirm that you want to see a quick instructions. Press “Skip” button to close the window and use the default settings, or press “Get Started” to see an quick instructions that will assist you get to know AdGuard better. Each time, when you launch your computer, AdGuard will start automatically and block unwanted advertisements, “MAC OS is infected with Spyware” scam, as well as other harmful or misleading pages. Most commonly, the freeware setup file includes optional software like adware. So, be very careful when you agree to install anything. The best way – is to select a Custom, Advanced or Manual installation mode. Here uncheck all bundled apps in which you are unsure or that causes even a slightest suspicion. The main thing you should remember, you do not need to install any optional programs which you do not trust! Now your MAC should be clean of the adware that shows misleading “MAC OS is infected with Spyware” fake alerts on your MAC OS. We suggest that you keep AdGuard (to help you block unwanted popup advertisements and intrusive malicious sites) and MalwareBytes (to periodically scan your MAC OS for new adwares and other malicious software). If you are still having problems while trying to remove “MAC OS is infected with Spyware” pop-up scam from the Safari, Mozilla Firefox and Chrome, then ask for help here here.